For a fuller understanding of this article please first read Altar, Temple, Kingdom Part One and Altar, Temple, Kingdom Part Two. As Jesus related parable after parable to demonstrate kingdom life He presented to His hearers a Kingdom not to be imagined in a distant future but freely available in the present, or ‘at hand’. The Kingdom is not separated from its King. It is present wherever Jesus Christ reigns. As the manifest presence of the King is the very atmosphere of the Kingdom, to receive the undisputed reign of Christ is to receive His Kingdom. Pilate’s cross examination was two pronged. First he wanted to establish the geographical boundaries of Jesus’ claim to kingship. “Are you the King of the Jews?” If he could keep this matter as an internal dispute among the Jews he could dispose of it quickly. Secondly, if this Jesus was claiming only to be King of the Jews, the might of Rome was not threatened and this Galilean rabbi, (who looked anything but a king), and His bedraggled followers presented no military or political threat to Rome. Pilate’s career prospects would be safe. But Jesus refused to meet Pilate on His own ground. Unlike the kingdoms of the world His Kingdom is a spiritual kingdom. Nor can it be defined by political or geographical boundaries. Frustrated, Pilate tried once more to have Jesus state the location of his kingdom. “So You are a King?” “Yes”, says Jesus, “but if you want to speak of My Kingdom then we will speak in terms of its attributes, not of its boundaries. I have come to this world to represent My Kingdom which, unlike yours, is founded on truth. Anyone who loves truth will recognize me. Apparently you do not.” (see Psalm 45:3,4). However, truth was something Pilate evidently did not care to discuss that day. The fact is Jesus is King of the Jews, as He is King of all tribes and nations. Ironically, though Jesus Kingship was rejected by the Jewish leaders, it was proclaimed both at his birth and his death by Gentiles (Mat. 2:1,2; Luke 23:38; Jn 19:21,22). Jewish prophets including Nathan, Isaiah, Jeremiah, and Zechariah had foretold the coming King (2 Sam. 7:12-16; Is. 9:6,7; 11:1-5; Jer. 23:5,6, Zech. 6:12,13). Jewish ears heard these prophecies read out regularly in the synagogues. Jewish tongues repeated them in prayer and in times of despair. Jewish eyes witnessed the signs and wonders that testified that here was the One the prophets and the scriptures had spoken of (Jn. 5:36; 10:25). Yet, bound to its temple system, Israel as a nation ultimately failed to receive their King and His Kingdom. Herein lies a sober warning for today’s church. The contemporary temple system, built as it has been on church centrality, hierarchy, and law keeping, cannot contain the fullness of the Kingdom of God. The lesser must give way to the greater. The temple made and maintained by human hands was only ever a shadow of the spiritual temple of living stones formed and honed by the Spirit of God. Something greater than the church/temple system is breaking through here and now that will not be held back. The choice to receive or reject it is before us, but the choice is not optional. And what of the man-made temple system we have clung to so tenaciously? Shall the temple disappear altogether? No, God’s temple is an essential component of His Kingdom, but He has ordained that His people are to be His temple (1 Peter 2:5). We have glorified our own denominations, traditions, and religious buildings to the extent they have become the object of our worship rather than the God they are meant to represent. We have exalted a vast hierarchy of human personalities as our mediators, priests and kings, in place of the King Himself. Masses of us have convinced ourselves we need ‘covering’ from pseudo apostles and prophets who are busy building their own kingdoms rather than preaching the true Kingdom. We are the people of God – from who or what do we need other covering? 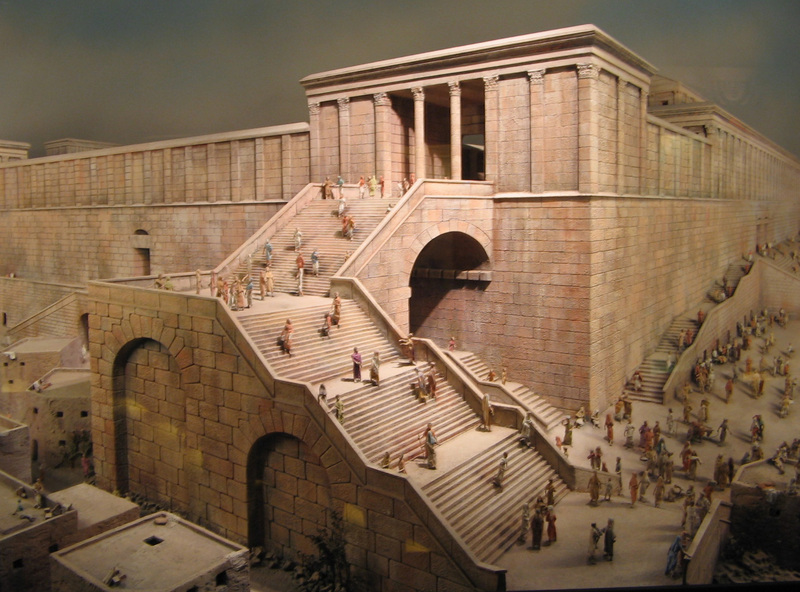 Our Season of the Temple is passing away and God will not be found among its ruins. God chooses to dwell within a thriving spiritual house of living, human stones being molded into the image of His Son. His priesthood is a nation of Kingdom dwellers, sold out disciples without regard for class, race or gender. I love the name penned by Dietrich Bonhoeffer for such ones – the “fellowship of the crucified”. Receiving our Kingdom Season will require a willingness on our part to relinquish the security of what has formerly passed as normal “church life”, with its atmosphere of tradition, programs and predictability. It will require us to ‘leave our nets” and follow King Jesus unconditionally. It will require us to love Christ more than the temple. For some, this will mean loss of income, loss of friends and family, loss of ministry and loss of reputation. For many, the price will be too much. The flock receiving the Kingdom is, after all, ‘little” (Luke 12:32). The Kingdom is bestowed, not built (Luke 22:29); the Kingdom is earnestly sought, not wished for (Matt. 6:33); and the Kingdom must be received or else it is rejected (Matt. 11:12; Heb. 12:28). Kingdom life is life in the realm of the Spirit where the will of God prevails and the reign of Christ is undisputed. In the Kingdom our lives are increasingly lived in the tangible Presence of God even as we physically walk in this world. We are becoming more conscious of the realities of the Kingdom than the passing environment of the world. “Oh, you mean more spiritually minded than earthly good?” I hear some ask. Yes, because no lasting good can be done on earth unless one is spiritually minded. Above all, the Kingdom is spontaneous, breaking through and manifesting in the atmosphere of the earth at the will of the King. Kingdom dwellers must be so readily available and so in tune with the King that at any moment of His choosing they become conductors of His Kingdom into whatever earthly situation they find themselves. Think of Peter stepping out of a boat into a raging sea. Think of Philip overtaking a moving chariot. Think of Stephen praying for his murderers even as they stoned him to death. These and many other scriptural examples are the Kingdom breaking through spontaneously and powerfully into the world’s realm. The apostle Paul wrote to the church in Colosse exhorting them to not be moved away from the ‘hope of the gospel which you heard’ (Col. 1:23). This gospel, which they had heard form his own lips, was the gospel of the Kingdom for it is the only gospel Paul preached (Acts 20:25, 28:23). He goes on to state that He had been given a particular ministry by God for the sake of the church. This ministry was the stewardship of a great mystery hidden throughout ages (Col. 1:24-27). The mystery is “Christ in you”. “It is Him we preach”, says Paul (Col. 1:28) as if to differentiate from any other version of Christ they may have heard. This Christ, this Christ in us, His people, is the very essence of Kingdom life. Whenever we see the title “Christ” in scripture we should recognize that now we are beholding Christ Jesus the almighty and supreme King. This Christ, this King, is so much more than the “Jesus, come into my life” I encountered at the Altar Season, and so much more than the “Jesus who strengthens me to do all things” of the Temple Season. It is Christ Jesus, Eternal King of Heaven and Earth, IN us, in all His glory, all His power and all His majesty, doing all. If you have read this far, just stop and consider that for a moment. This is a profound mystery, not able to be imagined by human minds without the indwelling Spirit of revelation. Astonishingly, it is a mystery in which we are being invited to participate. We need to make room in ourselves to receive this mysterious, sovereign, risen Christ the King, the One who fills all in all, who is greater than any picture of Him we have previously held. We cannot do that while clinging to what is fading away. The Kingdom of God is not demonstrated in word alone, but backed up by power (1 Cor. 4:20). The power of the Kingdom is the power of Christ the King’s endless, dynamic, supernatural Life, which He chooses to make manifest in mortal human vessels solely through the Spirit of the Living God (Heb. 7:15,16). This is a mystery the world cannot receive and the church has barely begun to grasp. Christ in us reaching out to the world as Reconciler; Christ in us interceding as Great High Priest; Christ in us restoring the sick and the suffering as Healer; Christ in us, Fulfiller of the Law; Christ in us as Living Word; Christ in us as Apostle; Christ in us as Prophet; Christ in us as Evangelist, Teacher and Shepherd. And over all, Christ reigning in us as King of all Kings! This quickly advancing Kingdom Season is not about the Kingdom of God moving into world institutions and transforming them, as some are teaching in these days. The Kingdom and the world do not mix for the Kingdom has nothing to do with this world and its myriad systems (Jn. 18:36). The world is not going to receive the Kingdom at this time. On the contrary: the world, as it always has done, is going to persecute the bearers of the Kingdom and those who cling to the fading temple system will join it, believing they do God a favor (Jn. 16:2). Nevertheless nothing will hold back the increase of this Kingdom. The invasion of God’s Kingdom on earth took place with the incarnation of Christ. The Kingdom has steadily been advancing since, mostly unnoticed (Lk. 17:20). We are on the dawn of an hour like no other in earthly history when Christ shall manifest His Kingdom through a crucified, resurrected people who love Him more than they love their own lives. These are those who, having caught sight of “something greater” cannot turn back towards the passing comfort of the man-made, man-controlled temple system. Unseen by the world, disregarded by institutional religion, they are becoming the true dwelling place of God on earth. The prayer repeated by every generation of Christ’s disciples since His ascension to the Father is being fulfilled, “Let Your Kingdom come”. The Kingdom, though costly, is coming in those who are willing and eager to receive it. Blessings to you and thank you. Blessings to you also Patrick. Thank you once again for blessing the Body of Christ with such an insightful series. So deep, so pure yet so true. Am awed and I thank the Lord for using you to make sense in connecting the altar, temple and kingdom so brilliantly leaving me well informed. Lydia, It is nice to hear from you again. Thankyou for commenting. I hope things are going well for you! Cheryl ~ I am blessed by your honest heart reply to Paul’s comment. I too struggle within when writing Vineyard Days sometimes…am I overstepping in my own flesh, or is my heart beating more in rhythm with Christ these days? The compelling when the Spirit says we must pen and publish overrides. I must trust Him even as I seemingly stumble out my obedience. This series of yours has been an exquisite rendering of the Spirit through you. I’m also glad I did not read Part Three until today and after I had posted my own a few days ago – particularly about that little word ‘in’. What a life-changing, completing word. Continued rich blessings in Christ Jesus. Thankyou Nancy for your kind words. Trusting Him even as we seemingly stumble out our obedience is a very good description of having a teaching blog dedicated to the Lord and His Bride. I’m grateful for others like yourself and Paul who are familiar with the process of that. Yes, the compelling when the Spirit begins to stir and bring forth something from within is paramount and somewhat like a birthing experience, only spiritually of course. Thankyou for taking time to be so encouraging. Cheryl, you have written this so purely. The thoughts flow in the Spirit, giving such a powerful declaration of all things in Christ while exposing the world’s religious system for what it is. Your communications are concise with truth and encouragement. This so well written! Bless you! Paul, thankyou for your kind comments, but if there is clarity and encouragement in any of my posts it is not down to me. I often struggle over such articles to separate what the Spirit is saying to me from my own thoughts and biases. It is not through any talent of my own but through the grace of Christ if He allows me to nourish and strengthen His Bride through what I write. These things are not always brought forth easily and often through much travail in the Spirit. If there is an appearance of ‘flowing’ it is despite me and my failings. Glory to God if He is able to bring forth fruit through these writings; that is my prayer. Quite simply ‘the cherry on top,’ Cheryl. Thanks from our hearts for being such a blessing to the King and his Kingdom people today! Blessings to you and the brothers and sisters in South Africa Erroll!